Habitat: Native to the Mediterranean region and south east England. Grows along roadsides and waste areas, preferring high fertility soils. 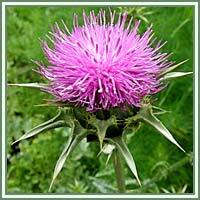 Description: Milk Thistle is an annual or biannual plant. Grows up to 2 meters in height. It has a firm, ridged main stem, and deeply lobed, alternately arranged along the stem. Leaves are dark green with yellow, spiny margins. Each stem ends with a single flower head, with purple disc flowers. Medicinal use: Milk Thistle has been used medicinally for nearly two centuries. It was most commonly used to stimulate lactation in nursing mothers, and in the treatments of liver and gallbladder disorders. A flavonoid complex, silymarin, extracted from the seeds is its chief active component. Silybin, part of the chemical structure of silymarin, acts as an antioxidant blocking the liver toxins from entering the liver, and stimulating regeneration and formation of new liver cells. 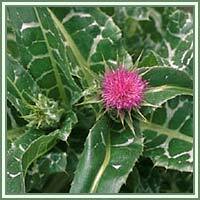 Milk Thistle is also beneficial in minimizing the side effects of cancer chemotherapy. Safety: Some herbs could interact with certain medication. Therefore, it is advisable to consult your doctor before consumption of any herb.